Does Didier Drogba have shares in Ryanair? Unfortunately I don’t have a picture. I didn’t have a camera handy, but even if I had the chances are I would have been arrested on suspected terrorism/espionage charges as a potential spy for Easyjet. 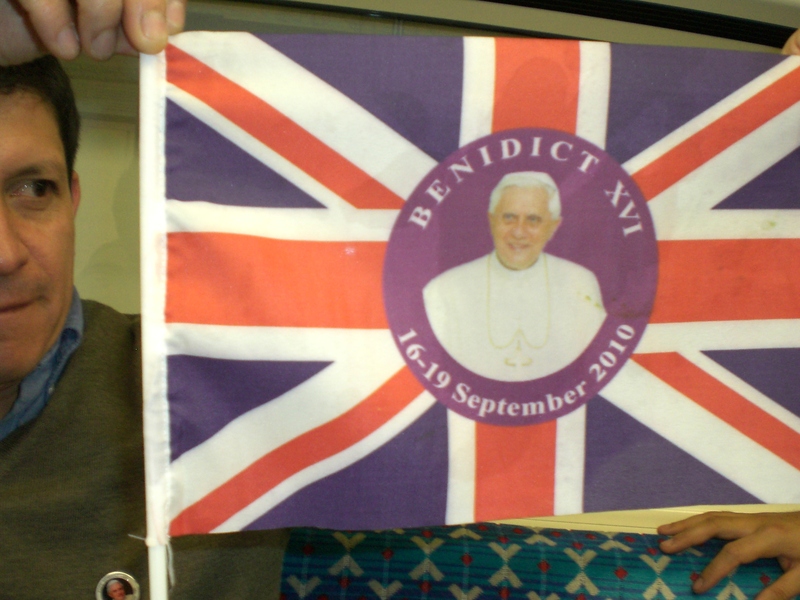 However the flag in question is illustrated below. As Ryanair just do short haul flights within Europe only, the Ivory Coast is somewhat outside its jurisdiction. The only famous Ivoirien who springs to mind is the foul-mouthed, referee-abusing Chelsea centre forward Didier Drogba. A man who’s not short of a shilling or two. Is it possible that he’s done some kind of a deal with Ryanair – or does he have shares in the company? Over-optimistic Irish soccer supporters who had already booked their tickets to South Africa for the World Cup needn’t worry. All they have to do is turn their flags around and support Ivory Coast. And Thierry Henry doesn’t play for them. 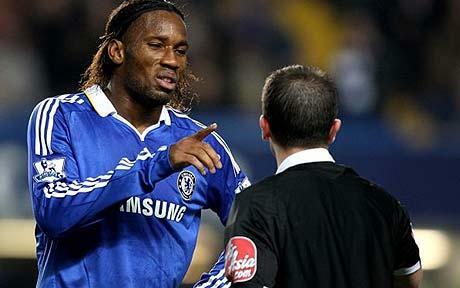 Didier Drogba abusing the referee: Does he have shares in Ryanair? Visa Card Apartheid Flags to be banned in the Rainbow Nation? The South African political commentator Khaya Dlanga has called for the old apartheid-era national flag to be banned, echoing the ban on swastikas in post-war Germany, after a rugby supporter was spotted waving the said item at a recent rugby match. This flag (when turned upside down) always used to remind me of the Visa card logo – which begs the question was the old SA government receiving secret donations from Visa to prop up its regime? Will Visa cards also be banned? There are obvious connotations for oppression and bigotry (not to mention unwelcome bank statements!) associated with this flag harking back to the days when 80% of the population had no say in the running of the country. And the presence of the union jack and Dutch flag in the middle tier serve as a reminder of the country’s colonial past, which many South Africans would no doubt like to forget. While we’re on the subject, it baffles me as to why independent progressive countries like Australia and New Zealand still insist on having the union jack in the top left corner of their flags as if to remind themselves of the legacy of their colonial past – particularly when you think about the animosity with “the poms” when it comes to cricket and rugby. Yet they insist on holding on to the apron strings of Mother England, a sentiment which means little to the average Maori or Aborigine. The Brazilians don’t have a Portuguese flag on their national flag, the Mexicans don’t have a Spanish flag on theirs. But that’s a whole new debate. Back in the day South Africa was not a popular country. I remember hearing on the news around about 1985 of an incident in Dublin when a supermarket check-out girl refused to sell a customer South African fruit. A number of well-known rock musicians got into trouble for playing at the infamous Sun City resort. During his incarceration Nelson Mandela became an iconic figure throughout the world and championed by some of the biggest names in entertainment from Peter Gabriel to Sting. Yet to the shame of western governments who refused to impose economic sanctions on SA, apartheid continued for much longer than it should have. Gold, diamonds and oranges were obviously more important to them than social justice. However western powers continue to back totalitarian governments from Saudi Arabia to Uzbekistan when it ties in with their selfish, strategic or economic interests. Oppressive regimes were (and still are) present in several other African countries of course, but unlike many of these countries SA was no impoverished third world tin-pot dictatorship. This was a supposedly developed forward-looking civilised western society. A few white South Africans still no doubt nostalgically yearn for a return to the “good old days” when “kaffirs” knew their place, but the rest of the world has moved on. These were bizarre times indeed. These were the days when black South Africans supported anyone but their own country in rugby, though not long before Mandela in a Springboks shirt made the noble gesture of presenting the world cup to the victorious SA team. The apartheid regime was a goldmine for satirical comedians. The 1970s comedy team The Goodies brilliantly sent up the concept in this classic episode (the best bits happen around 1 minute and 35 seconds into the clip) where they introduce a new law called “apart-height” which discriminates against short people. There was also the Spitting Image song “I’ve never met a nice South African” – which although a little harsh and inaccurate, it is mildly amusing (unless you’re South African of course). I should say at this point, that having lived in London for the best part of a decade, I’ve met many nice South Africans. It’s also worth pointing out that even South African comedians like Peter Dirk-Uys were ridiculing their own government at the time. We also had films like Richard Attenborough’s Cry Freedom, a portrait of the life and death of political activist Steve Biko and his friendship with the white journalist Donald Woods. After Hollywood had endured much criticism for its politically incorrect habit of portraying villains as black or Hispanic, one of the films in the Lethal Weapon series featured white South Africans as the main bad guys, a fashionable trend at the time. How things have changed. But although that democracy now prevails in SA, things are far from sweet and rosy. It’s the all too familiar story of yesterday’s oppressed becoming today’s oppressors. The Catholic church in Ireland endured centuries of persecution under British rule, but when part of the country gained independence, the church abused its special position and became a brutally oppressive institution aided by the state for the best part of 50 years. There are striking parallels here with the ANC. The current SA government’s incompetence in dealing with AIDS in the country, its inability to effectively deal with the violent crime epidemic, its refusal to take Mugabe to task over the catastrophe engulfing Zimbabwe and the widespread accusations of corruption and nepotism within the party as an elitist minority lives the high life, while the majority of citizens live in poverty all beg the question – has anything really changed? We’re now back the flag question. In a country which supposedly prides itself on diversity and freedom of expression, banning the old flag, as some commentators have pointed out would be counterproductive. Practical reasons aside, it’s unlikely that a drunken Afrikaaner will stick his flag into a chip & pin machine by mistake instead of his credit card when paying for the Oranjeboom and biltong for the braai at the local supermarket. It could do irreparable damage to the machine – not to mention the flag. I’m reminded of a well-documented incident in the 1960s when the then young firebrand preacher Ian Paisley protested at the presence of an Irish tricolour (which was at the time banned in Northern Ireland and few if any were openly displayed even in nationalist areas) at the Sinn Féin office on Belfast’s Falls Road. A mob encouraged by Paisley converged on the premises and smashed the window in an attempt to remove the offending flag. A few days later, in response to this incident hundreds of tricolours were put up all over West Belfast. I’m sure some of them are still there to this day. Lessons to be learned indeed.